Llandudno Pier is one of the longest and grandest piers in the United Kingdom. Llandudno Pier consists of two parts with the original opening in 1877 which is over 1200ft in length and resembles a traditional pier in all senses. At the end of the pier is a large pavillion which is to today used as an amusement arcade. The second part of the pier the was constructed in 1891 and runs from the original pier opening towards Llandudno's north shore and is built entirely from stone. The second stage also added a landing stage for ships at the end of the pier.<p> <b>Machine 1</b> The machine is in the bar at the end of the pier. 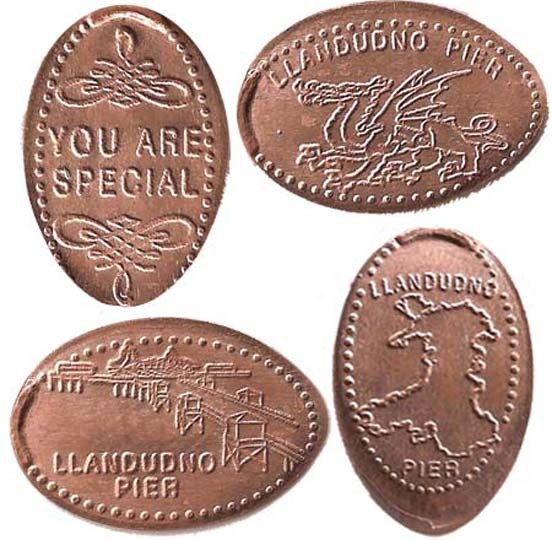 Designs are: <br> 1) 'You Are Special, <br> 2) 'Llandudno Pier', Dragon, <br> 3) 'Llandudno Pier', Image of Pier <br> 4) 'Llandudno Pier', image of Wales <p> Updated: UK Pennies. <p> 8/15/18. The machine is out of order. Llandudno Pier is one of the longest and grandest piers in the United Kingdom. Llandudno Pier consists of two parts with the original opening in 1877 which is over 1200ft in length and resembles a traditional pier in all senses. At the end of the pier is a large pavillion which is to today used as an amusement arcade. The second part of the pier the was constructed in 1891 and runs from the original pier opening towards Llandudno's north shore and is built entirely from stone. The second stage also added a landing stage for ships at the end of the pier. 8/15/18. The machine is out of order.